It's the album that was supposed to be made more than 30 years ago. Culver Kingz is vocalist Billy Trudel and multi-instrumentalist Michael Thompson, who came together back in 1983 to write songs and start a band to be called Slang. It never happened, and both men went on to different projects and a lifetime in the industry playing with various luminaries. Fast forward to 2011 as Trudel and Thompson are able to finish what they started. This Time arrives on the Escape Music label. With one spin, as with that silver DeLorean, I was transported back to the late Seventies and early Eighties by the Culver Kingz sound. Essentially, this music turns on that elusive West Coast sound, a sound light and breezy, moved by ambitious melodies and significant vocal harmonies. Yet, with Trudel you get more than smooth melodic vocals. Within his vocals is the voice of both soul and blues. The result is clean clarity with inherent strength and dripping with emotion. For Thompson, who handled all the instruments, his compositions compliment Trudel's voice by building upon melody and smooth groove, and often lead by his sleek and effortly subtle guitar lines. As for the songs themselves, the majority evolve around that smooth West Coast sound, having a gentle and accessible feeling, and allowing Trudel's voice to lead. Yet at the start Dirty Secret and Chains Get Broken break out with some more brisky and frisky riffs, the former having a rousing guitar solo in the end. Fundamentally, if this is what Trudel and Thompson had in mind 30 years ago, they nailed it. Yet, This Time is also an album lost in time. You won't hear this music being played anywhere else. It makes me wonder if the album will only appeal to us mid-lifers who remember those days. Otherwise, Culver Kingz This Time is tastefully done, quite entertaining, West Coast AOR melodic rock, and easily recommended. 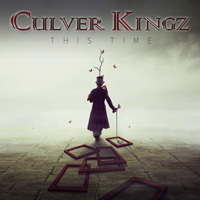 Culver Kingz This Time is tastefully done, quite entertaining, West Coast AOR melodic rock, and easily recommended.